For our Soundwalk project, we decided on a concept of an “alien” wondering inside the Tisch building and finding itself at home, which is the ITP floor. First, we tried mapping out the story and planning in what order the events will occur. We brainstormed a little and in order to figure out our arc. After making some sketches, we explored the Tisch floors ourselves in order to find the spirit of each floor. After our tour, we had the impression that most of the floors were silent, almost like inhabited, which is a big contrast to our floor (4th/ITP). We decided on the 2nd floor because for us it also had a personality or spirit. 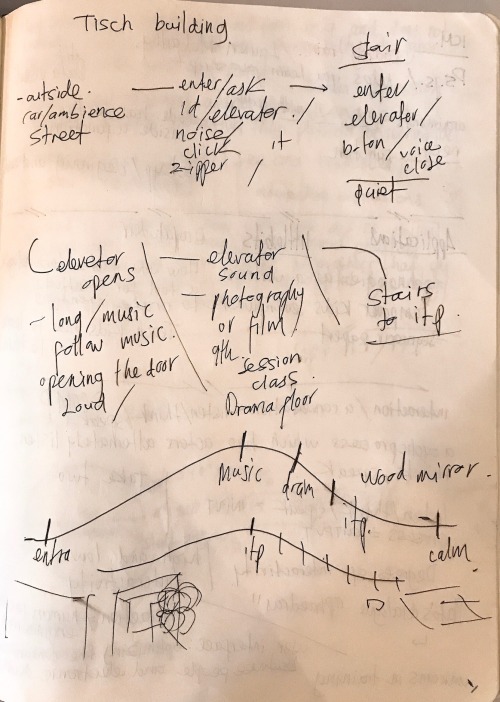 We then recorded sounds that most effectively captured the characteristics of each floor. 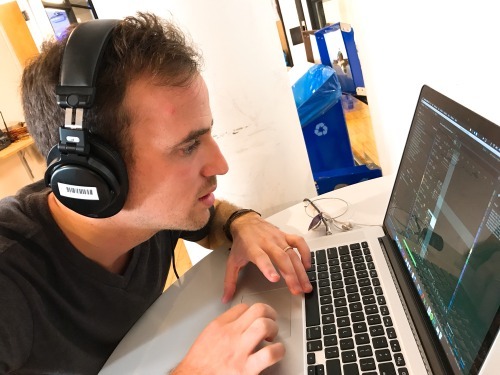 Finally, on the ITP floor, we thought of recording not only distinct ITP floor sounds but also of students conversing in three different languages: Spanish, Hebrew, and Korean. (We chose those three languages because they were our group’s native language). Moreover, we thought that emphasized the diversity and spirit of ITP. 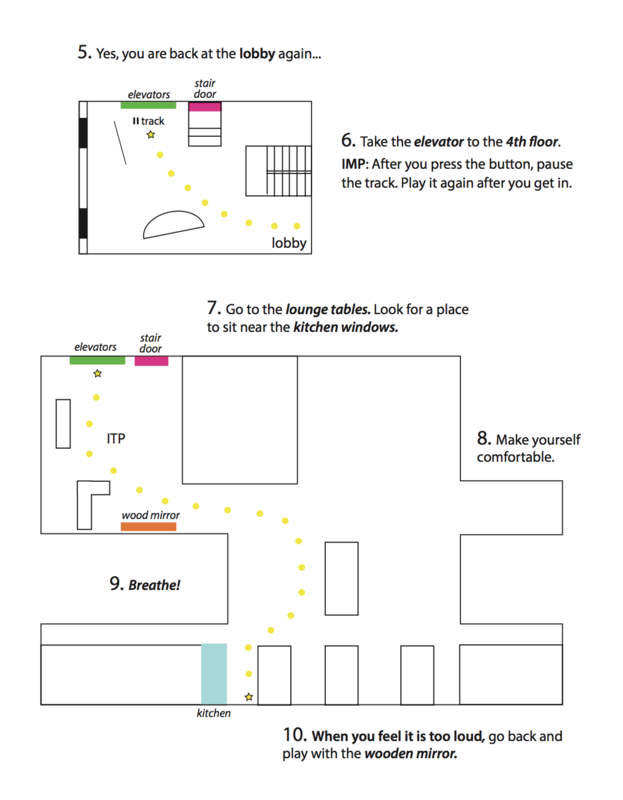 To make our soundwalk clearer, we designed a series of maps for the listener to refer to. 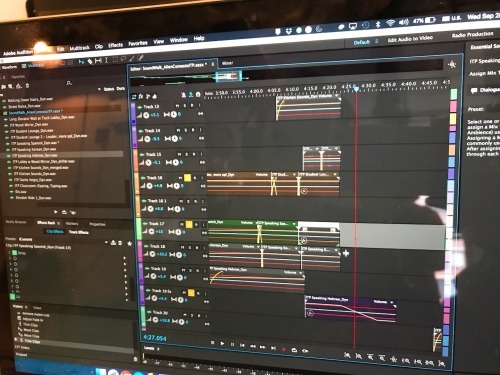 We then moved on to Adobe Audition and started editing our recordings. To our disappointment, the volume of all our files was too low. We tried our best to increase the level and to decrease the background noise as much as possible. For future reference, we’ve decided to make sure to use the appropriate mike and to set the volume as high as possible. Other than the volume issue, we were fairly satisfied with the result of our project. 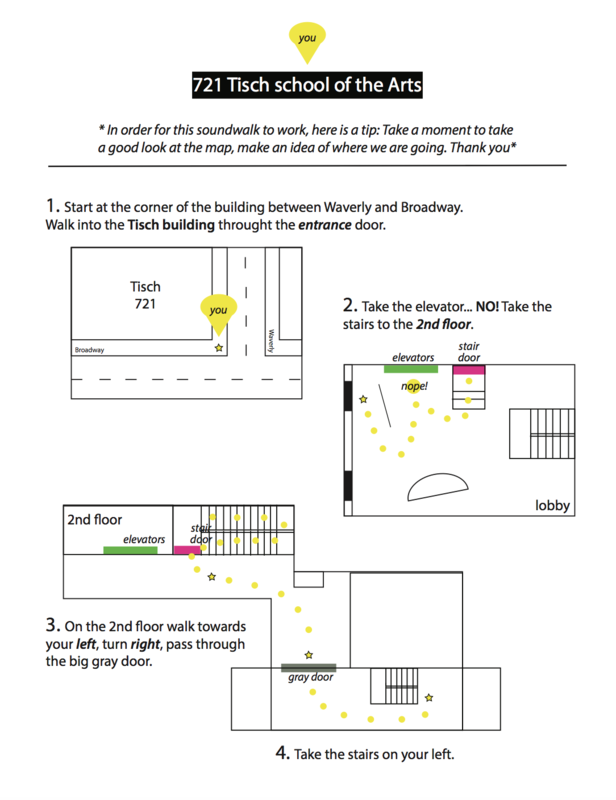 Our Soundwalk to Tisch can be found here. It was a great project to be part of, we learned a lot and on future projects will make some changes; like using the appropriate mic set the recording levels as high as the environment and the natural sound level of the room allow it. Also, to be more aware of the factors that might affect the recordings, like the wind or the movement while we were walking. We try our own SoundWalk to see if our timing, sound and map directions were correct, but because we knew our soundwalk and tested it in the morning, we weren’t that conscious about how the ambience sound could change. 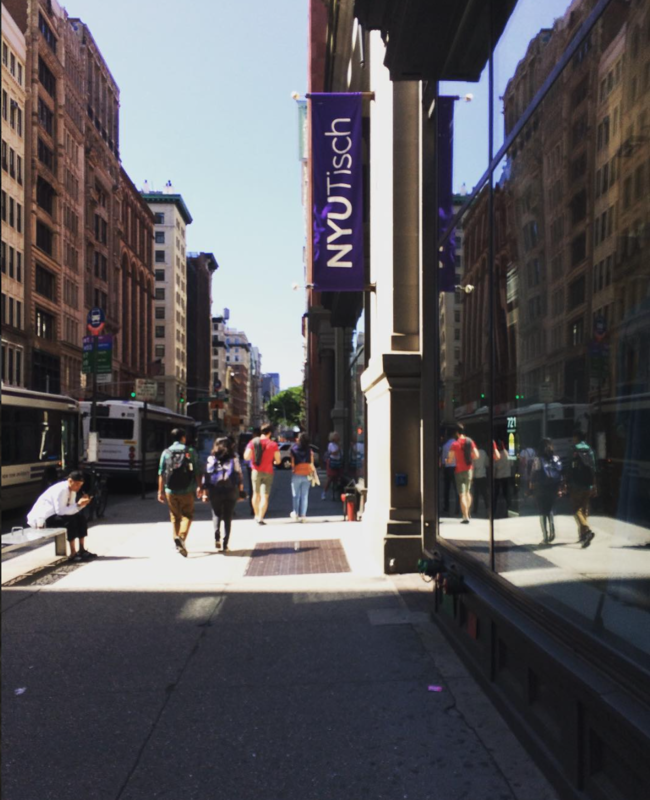 The track sounded good for us when Tisch was empty but our piece didn’t have good enough levels to endure Tisch rush hours, lesson learned right there. next time will take the time to ask someone else to test the piece and give feedback. 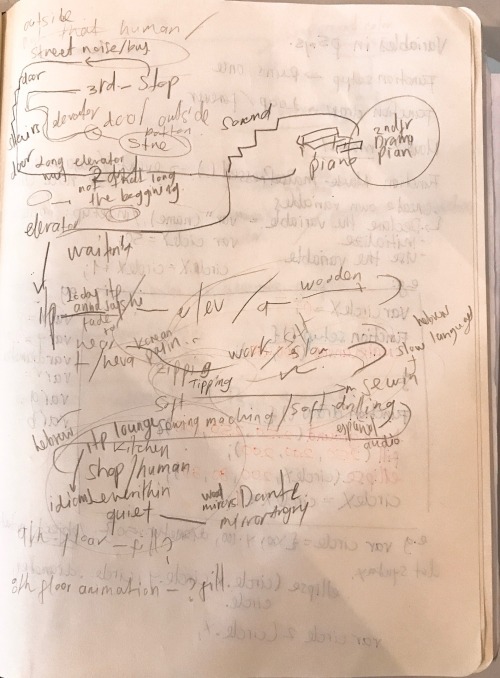 Thinking about how to design the listeners’ experience and the interface of the walk was tricky. 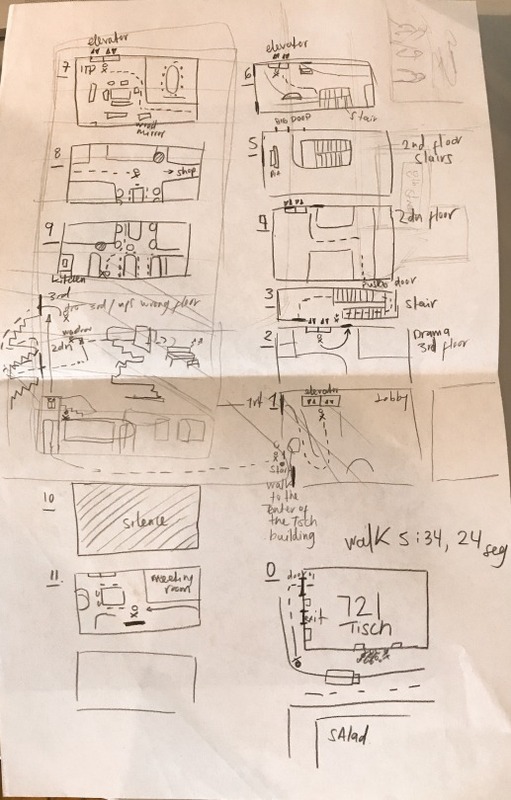 How to ensure that they would walk the path we planned for them – there are timed sounds like opening doors, etc. How to not make them look at the map every second and be distracted from their listening atmosphere. We were all very involved in all aspects of the project through continuous communication, feedback and turns, although Ayal was very impressive in Audition. Overall, we were very happy with the result and with each other’s collaboration.